Mabel Stark was the beautiful blonde wild animal tamer who doubled for MAE WEST during some of the big top scenes in "I'm No Angel" . • • When Jack West took his young daughter to Bostock's Lions in Coney Island, Mae first became aware of beautiful female trainers such as the fearless trailblazer Marie-Louise Morelli, billed as Queen of the Jaguars. Awed by Madame Morelli's smooth command in the cage of her "treacherous pets," the curly-haired little Brooklynite (born in August under the sign of Leo) decided one day she, too, would come face to face with the King of Beasts. • • Mabel Stark, whose real name was Mary Haynie, was born in Kentucky on 9 December 1889. In 1922, she joined the Ringling Brothers Barnum and Bailey Circus and performed in Madison Square Garden with snarling tigers and a black panther. 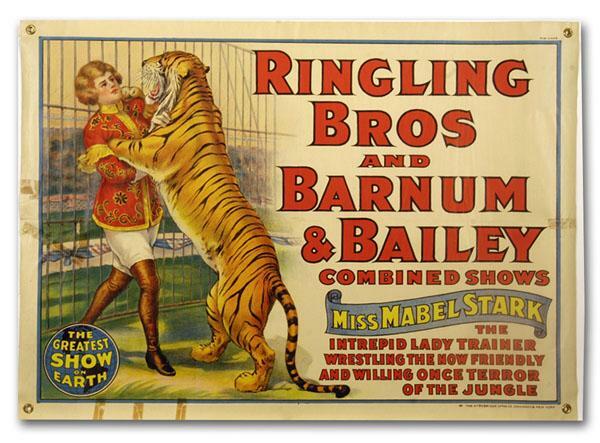 By the end of that season, of the six wild animal acts featured with the circus, Mabel Stark's was the most popular and she was featured on a poster with her favorite big cat Rajah. At one point in her career, she would face eighteen snarling beasts in the ring. • • This colorful circus poster from the 1920s shows Mabel Stark with her beloved Rajah, whom she adopted as a mistreated, sickly cub, and shared her home with. • • During a photo shoot with Mabel Stark, Mae West was asked if she could see herself trading places with anyone and she said: "Yes, it would be this Mabel Stark, the Tiger Girl!" To which Mabel responded, "Fine with me. I'd love to be Mae West!" • • Unfortunately, in 1968 her employer Jungleland was sold to a new owner who disliked Mabel Stark and fired her. Soon after she left, one of her tigers escaped and was shot. Stark was angry and hurt about the animal's destruction and felt that she could have safely secured the tiger if the owners had asked for her assistance. Three months later, she killed herself by an overdose of barbiturates. • • In the last pages of her autobiography, Hold That Tiger, Mabel Stark writes: "The chute door opens as I crack my whip and shout, 'Let them come,' Out slink the striped cats, snarling and roaring, leaping at each other or at me. It's a matchless thrill, and life without it is not worth while to me." • • At the age of 78, in her home in Thousand Oaks, California, Mabel Stark drew her last breath and left the world in April — — on 20 April 1968. • • Thursday 20 April 1933 is the birthdate of Monte Landis, an American character actor who had worked with Mae West when he played the role of Vince in "Myra Breckinridge" . We wish the funnyman a Happy Birthday! • • Source: Article: "Why Is It That Women Are Seen As Less Competent?" written by Birute Regine, Ed.D. for Forbes Magazine; posted on 14 April 2011. • • The Mae West Blog was started seven years ago in July 2004. You are reading the 1905th blog post. Unlike many blogs, which draw upon reprinted content from a newspaper or a magazine and/ or summaries, links, or photos, the mainstay of this blog is its fresh material focused on the life and career of Mae West, herself an American original. CORRECTIONS: MABEL STARK was born on Sunday, 9 December 1888. Source: Her handwritten letter of Monday, 24 February 1958, to her niece, Enid Barber, regarding family history, which is in my possession. She was 79 at death. Confusion arises from her shaving five years off her birthyear to 1893, on her Social Security card application of 1937. The new operators of Jungleland took over in 1965, when I was hired. They turned Mabel out on Friday, 10 November 1967, when I assisted her in taking care of her tigers for her last time. Don "Okie" Carr and I helped her move out of her dressing room, and took her belongings to her home. 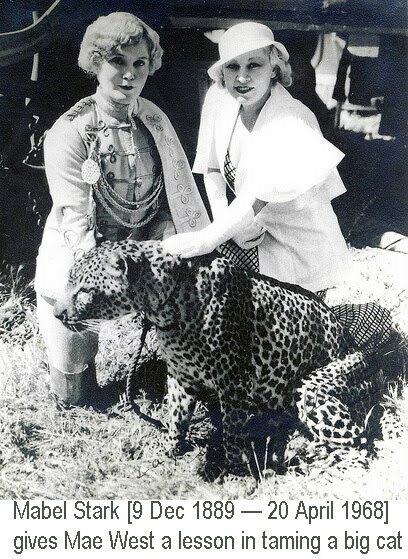 When her tigress, Goldie, escaped and was shot dead, on Sunday, 14 April 1968, Mabel decided to end her own life, as she had talked of doing if separated from her tigers. She was found dead by her cook, Pauline LeGrand, at 3:30 pm, on Saturday, 20 April 1968. Source: I was there. The Coroner determined the death was suicide, from an overdose of barbiturates, and believed she had been dead some 3 days, possibly since April 16th, when I last saw her alive, or the 17th. Source: Harold Kade, MD, Forensic Pathologist. Mabel Stark had mentored my apprenticeship on tiger training and caretaking from 1965 until hours before her death. I had talked on the phone with her on April 16th, about advanced specifics of rearing tiger cubs. (Signed) Roger Smith -23 June 2012. Roger Smith: Thank you very much!!!! I grew up in T.O. and saw Mabel at Jungleland. I have accumulated quite a bit of information on her. I am trying to find out if she had a burial site (or was cremated and where. I do not see a Find A Grave site and would like to establish one. Not sure what given name was used on her death certificate. Any help you can provide would be appreciated.